We’ve been eating this once a week, so I had to share! I’ve been developing the perfect gluten free batter recipe for a few weeks; last Sunday, while we were at Sagra for their amazing weekend brunch, our waiter surprised us with a gift of mixed pepper flakes! They’re serious about locally grown, organic ingredients. They even have their own greenhouse in South Austin. And they accept vegetables from their customers! Eric often takes batches of homegrown produce to Sagra (squash, chiles, pumpkins). Our chiles have made their way into infused olive oils, for instance. Sometimes we get to sample the latest cocktails dreamed up by the amazing bartender. This week, we got these amazing pepper flakes. I can’t remember the whole litany, but I know it included jalapeño, habanero, poblano, anaheim, serrano, and hatch chiles. I decided to incorporate them into my fried chicken batter, and they took the result from good to fantastic! We’ve been buying chicken tenders from Wheatsville lately, so that’s what I fried. Note that frying whole pieces will take longer, depending on the part, and bone-in chicken will take considerably longer. In fact, that would be a whole different recipe, involving a lot more frying fat and a lot more splatter. But this recipe is perfect for smaller pieces of meat. It would also be excellent for veggies, such as zucchini (which I served roasted, as a side dish). Another secret is the bacon fat. I keep two Mason jars in the fridge at all times. Every time I fry some bacon (so, practically daily), I drain it through a paper towel and into the jar. I then use it for all manner of things, such as extra decadent scrambled eggs, perfectly fried corn tortillas, or Yorkshire puddings. If you have a problem with deep frying things in bacon fat, you’re on the wrong blog! 1. Using two shallow dishes (I have stainless steel dredging pans just for this purpose), crack eggs (white and yolks) into one and lightly beat until well mixed; thoroughly mix dry ingredients in the other to create your batter. Set them up in order, depending on whether you’re moving the chicken left or right, with a large plate at the end for your dipped and battered meat. 2. Dredge each piece of chicken as follows: dip the meat into the egg mixture, turning it over so that the whole piece is coated in a thin layer of gooey egg. Immediately drop it into the batter mix and thoroughly coat it, turning over a few times. Gently place the battered chicken on the plate to the side. Continue until all pieces are battered. Allow them to sit for at least ten minutes to give the batter a chance to set. This will help prevent batter from sloughing off in the pan. 3. Meanwhile, in a large, preferably cast iron, skillet, heat half the bacon fat over medium high heat until melted and popping. The fat should be at least a half inch deep, preferably an inch. You may need to adjust the size of skillet you use or amount of fat in order to get just the right amount. 4. Next, gingerly lay pieces of chicken into the grease until the pan is full, with room to maneuver each piece with a scratch-proof spatula. You may have to do two, or even three, rounds of frying. The chicken will immediately begin to pop and spit; if this presents a problem, use a splatter screen when not turning the meat. 5. Allow the chicken to cook for about five minutes on each side, turning them over carefully with your spatula, until the batter is nicely browned and crisp. Gently scoop each piece up and place it on paper towels aside on a plate to cool and drain the excess grease. Repeat until all the chicken is fried. 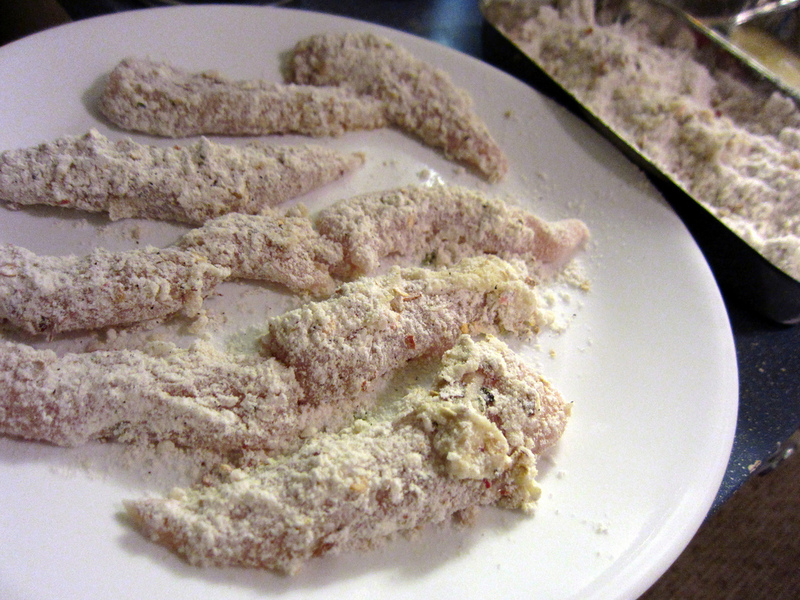 If you’re unsure whether the chicken is fully cooked, just cut one of the tenders open with a knife and see. The meat should be white throughout and tender, but not rubbery. If it is rubbery, you’ve cooked it too long. Adjust your times accordingly for the rest of the batch. Fully cooked chicken should be 165° in the center. Use a cooking thermometer to test if you are unsure. After you do this a few times, you will become an expert on the cooking times for different meats based on the combination of your particular oven or stove and chosen cooking method. After the meat has drained for a few minutes, you can wrap it up in clean cloth to serve a bit later with sides, or serve it immediately while it’s piping hot. I like this Tex-Mex fried chicken with hot sauce (we keep a bottle of Cholula on hand at all times), but Eric also likes to dip his tenders in Ranch dressing, which is also delicious with the side dish I like to make: roasted zucchini wedges drizzled with olive oil, salt, pepper, and dill. Go crazy! This entry was posted in Family, Gluten Free, Mains, Meat, Poultry, Recipes, Southern, Tex-Mex by Susan. Bookmark the permalink. That looks awesome! If I don’t have bacon fat, what do you recommend as a substitute? Would duck fat work? Our local French bistro cooks its french fries in duck fat, and they taste great. Oh, man, I’ve never tried duck fat! You should try it and report back. Haha. I think the most traditional fat to use is lard. That would definitely work well, too. I suspect you could also shallow pan-fry with coconut oil, if you want a coconutty result. In fact, I may try that next!